Those living to the south of London are often lucky enough to have two different ways into London by rail. From Brighton or East Croydon you can travel to Victoria or London Bridge, and from Otford you can get services to Victoria or Blackfriars. On some routes the terminus is different on working days or Sundays, or in peak hours and off-peak hours. Sometimes this choice is due to the competition between two rival rail companies in the 19th century (see Bitter competition - and its benefits), but it also reflects a desire by the Victorian railway companies to serve both the City of London and the West End, the businessman and the leisure traveller. For the first twenty or so years of the railway era there was no such choice. For destinations in Kent, Sussex or Surrey you would have travelled from London Bridge, which was terminus of both the London, Brighton & South Coast Railway and the South Eastern Railway – a role it still fulfils to this day, with services now provided by the Southern/Thameslink and Southeastern franchises. The only other terminus for trains to the south of London was Waterloo, which had opened in 1848, replacing Nine Elms as the head station for the London and South Western Railway. Both stations were at the time right on the edge of London, as were Euston (opened 1837), Paddington (1838), and Kings Cross (1852). The reason for this was that Parliament prohibited railways from coming into the city (even the Metropolitan Line, the first underground line, opened in 1863, had to obey this rule, skirting around what were in those days the boundaries of London). They were also not allowed to cross the River Thames. This rule weakened when Victoria station opened in 1860. The story of this station starts with the Great Exhibition of 1851, the world's first trade fair, which saw the Crystal Palace built in Hyde Park. When the exhibition ended, the palace was moved to a hilltop near Sydenham in South London - the area which bears its name to this day. There it remained a popular entertainments venue until 1936, when it burnt down in a fire. Large scale events were held in the Crystal Palace: it attracted well over a million visitors each year, and in 1883 one event had 4,000 singers and as many orchestra players. So it made sense to use the new technology of railways to transport people to it. The result was the West of London & Crystal Palace Railway, which was opened in 1856 between Battersea Wharf (near the southern end of Chelsea Bridge: the station was misleadingly named Pimlico) and the current Crystal Palace station, calling en route at Wandsworth Common, Balham, Streatham Hill, West Norwood and Gipsy Hill. 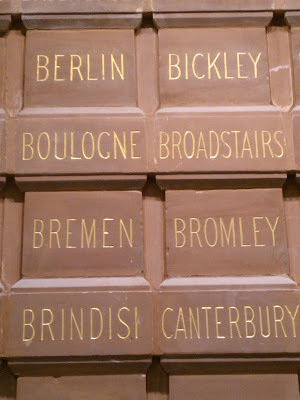 Two years later the line was extended to Beckenham Junction and Bromley (now Bromley South). It was obvious that Battersea Wharf was not an ideal terminus, however, and several railway companies soon cooperated to build a line across the river. When this opened, in 1860, Victoria station was born. It became a second terminus for the London, Brighton & South Coast Railway (who had originally asked to share the London and South Western Railway's lines into Waterloo but had been rebuffed). They drove south from Balham to link up with their existing London Bridge to Brighton main line at East Croydon. The London, Chatham & Dover Railway also used the West End of London lines to link its network to Victoria (see Bitter competition - and its benefits), building a station next door to the London & Brighton one, which opened in 1861. But in 1862-3 it built its own direct line to Victoria through Herne Hill and Brixton - the main line route to this day - and ceased to use the The West End of London lines, which were eventually sold to the London, Brighton & South Coast. This new direct line had to cross the main line out of Waterloo and originally went under them on a rather complicated route with steep gradients. This proved unsatisfactory and the current viaduct over the Waterloo main line was opened in 1867: amazingly as you cross it today the original line can still be seen below. The LCDR shared its station at Victoria with the Great Western Railway, which from 1863 to 1915 ran trains onto its system via Clapham Junction and the West London Line (not the same as the West End of London line mentioned above, but the line that links Clapham Junction and Willesden Junction and is now used by the Overground). Though side by side, the two stations at Victoria - LBSCR and LCDR - remained quite separate until 1924, a year after both companies were absorbed into Southern Railways (see The golden age of the railways), which is when the current archway between the two halves was created. You can see if you look at the facade of Victoria today that the architecture on either side is very different, and bizarrely the main electronic departure board at the station still lists “Chatham-side” trains in chronological order and then “Brighton-side” ones. The two sides had separate ticket offices right into the 1960s, and railway staff are still heard to refer to “Kent-side” and “Sussex-side” departures. The recently restored roof on the Chatham side, incidentally, is the original one from 1862, now a listed structure. The opening of Victoria meant that the London, Brighton & South Coast Railway could serve both the City and the West End, but even more of a worry for the South Eastern Railway was that its rival, the London, Chatham & Dover Railway, could run boat trains for the Channel ports right from the doorstep of the wealthy West End customers most likely to use them. What made this even more annoying was that two earlier attempts by the SER - to extend its lines closer to the West End - essentially to where Waterloo East station is today - had been rejected by parliament: the earliest such proposal had been in 1845. But now the company got the permission it needed and started to create a through station at London Bridge. Southeastern kept four terminus platforms at London Bridge, however, and right up until the early 1970s there were three parts to the station - the "high level" through platforms to Charing Cross and Cannon Street, the "low level" former South Eastern terminus platforms (under an arched roof), and the grander London, Brighton and South Coast terminus (under a separate arched roof). In all the two stations had 23 platforms. It was not until 1928 that a gap in the wall was made between the SER and LBSCR stations (then newly united under Southern Railways), but connections between the two remained awkward and impractical. Eventually after considerable Second World War damage the SER side was modernised from 1972 onwards, removing its arched roof. The LBSCR's Victorian roof remained intact until 2013, however, when it was dismantled as part of the current rebuild of the station. Due to be finished in 2018, this is adding three new through lines to the station in order to create space for Thameslink trains. From its new through platforms the SER extended its lines westwards and then across the river to Charing Cross, opened in 1864. This enabled it not just to serve both City and West End, but to do so with the same train - something no other line can do to this day. But by this time the London, Chatham & Dover was already encroaching further into its territory by opening Blackfriars station (see below). To counter that, the SER built a spur from its Charing Cross line over the river to a new City terminus at Cannon Street, opened in 1866. Right up until 1916 long distance trains to Ramsgate, Folkestone or Hastings served both stations - that is, they started at Charing Cross, were shunted to Cannon Street, and went on from there to their destination via London Bridge. This awkward arrangement was one reason why the SER was notorious for bad timekeeping. There was also a regular Charing Cross to Cannon Street shuttle which was a popular way to travel between the City and West End until the District Line was opened to Mansion House in 1871. The track link allowing trains to run from Charing Cross to Cannon Street still exists and is occasionally used during engineering works. The route from London Bridge to Charing Cross was always a bottleneck, however, with the SER only able to get permission to run two tracks across Borough Market, instead of the four it had elsewhere on the spur. The market (London’s original fruit and vegetable market, predating Covent Garden by centuries) was able to resist further expansion by referring to its 1550 royal charter and by a 1754 Act of Parliament that forbids it to use its property for any purpose other than a market. These ancient rights even blocked an attempted compulsory purchase order initiated by British Rail as it prepared for the launch of Thameslink services over the route in 1988. Only in the first decade of the new century has the impasse been resolved and a new viaduct threaded through the market as part of the Thameslink 2000 project. Today a basic commuter station that is busy only during rush hours, Cannon Street was originally an impressive terminus, with a fine arched roof and a grand hotel similar to the one that still exists at Charing Cross. The City Terminus Hotel, as it was called, was a popular place for business meetings and had a first floor ballroom that could seat 1000. The building was turned into offices in 1931 - in the 1950s my uncle remembers working in an office carved out of the former ballroom, with mirrors still in place on the walls - but was demolished in 1963. The arched roof of the station, damaged by World War II bombs, was dismantled in 1958, giving the riverside towers that once supported it a rather odd look today. The arched roof at Charing Cross met a more notorious fate. At 3.30pm on 5 December 1905 a loud crack was heard and it was noticed that one of the main roof girders had come loose. The station was evacuated and 15 minutes later the whole roof came down, killing five workmen and a bookstore vendor, and demolishing part of a neighbouring theatre. The roof was replaced with a more basic ridge and furrow roof, which lasted until the Embankment Place office building was built over the station in the late 1980s. More sturdy construction went into Hungerford Bridge - the bridge crossing the river to Charing Cross, which now has the Golden Jubilee footbridges either side. Take a look at it the next time you cross the river (or see the photo in The sparks effect). A sturdy, if workaday, piece of Victorian engineering, it has withstood the constant pounding of heavy trains for nearly 150 years without complaint. The brick piers of this bridge originally carried a suspension footbridge designed by Isambard Kingdom Brunel, which is why there is a footway today. The chains of the demolished suspension bridge were used to complete the Clifton Suspension Bridge in Bristol. With the SER now able to reach both the West End and City, the London & South Western Railway looked for a way to do the same. It had always planned to extend its lines into the City (which is one reason why the station concourse at Waterloo is elevated above ground level and the lines out of it are carried on arches), and it now built a bridge across the road to the South Eastern lines at Waterloo East (originally Waterloo Junction), getting permission from the SER to run its trains by this route into Cannon Street. But the two companies were continually squabbling over whose trains had priority and the link was not much used. The disused railway bridge for this link is still there, spanning Waterloo Road and now used as a storage space. The ghost of it lives on, perhaps, in the fact that tickets to 'London Terminals' are not swallowed up by Waterloo's automatic ticket barriers, as they are at other London terminals such as Victoria, and can be used for onward travel from Waterloo East to Cannon Street or London Bridge. The link to Waterloo East was not just disfunctional - it also split Waterloo into two and made it a disjointed station, with clusters of platforms in various locations. It was widely regarded as the most confusing of the London termini by the Victorians, and was memorably lampooned for this in Jerome K Jerome's comic novel Three Men in a Boat. In the end, in 1898, the company built what is now the Waterloo & City Line to give it access to the City. This was later operated by British Rail and only transferred to the London Underground network in 1994. Shortly afterwards the LSWR embarked on a monumental rebuilding of Waterloo which took from 1900 to 1922 and gave us the magnificent station we have today. As mentioned above, the London, Chatham and Dover Railway opened its City link in 1864, building a line north from Herne Hill to Blackfriars. This line was of key importance to the company in the late Victorian era, capturing business travel from London to the Continent. 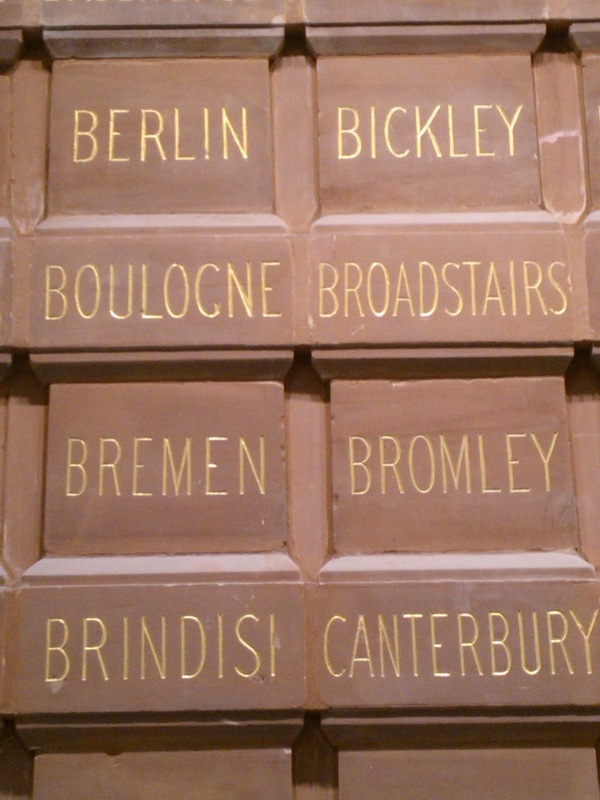 Stones from the facade of an earlier incarnation of the station, still preserved on its main concourse, show all the destinations that could be reached from it in its heyday - not just Margate, Ramsgate and Canterbury, but also Frankfurt, Paris, Vienna, Geneva, Dresden, Florence – and even St Petersburg (see photo below). All of these were reached via the LCDR’s lines to Dover and their express ferries to Calais. A portion of all LCDR main line trains – to Dover and other places on its network – started on the Blackfriars spur, and were joined to Victoria services at Herne Hill. The station itself has a complicated history. 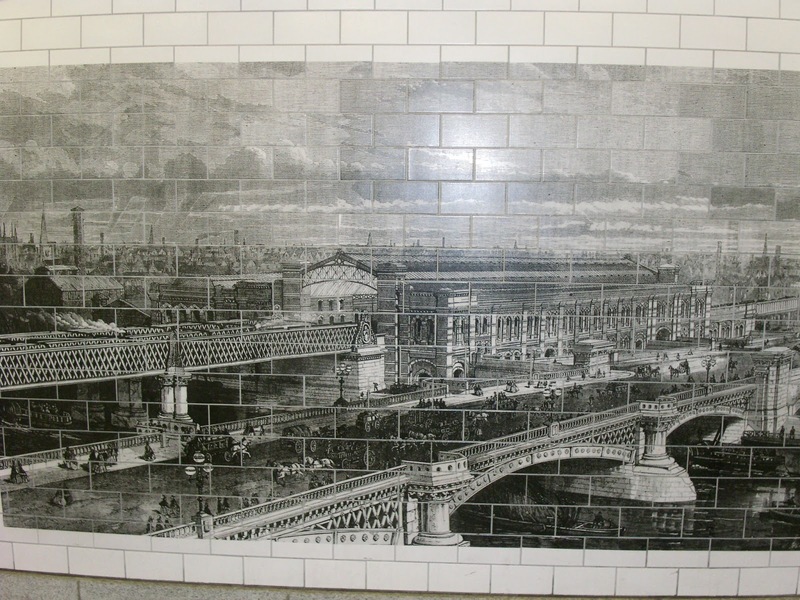 The original Blackfriars station opened on the south side of the river in 1864 under the name Blackfriars Bridge. There is a fine picture of it (see top of page) in the pedestrian subway that carries the Thames Path under Blackfriars Road. Some remains of it – a brick structure with arches – can also be seen just a little way to the south down Blackfriars Road, on the left before the intersection with Southwark Street. All this traffic meant Ludgate Hill became very congested, and so to ease the problem the LCDR created a branch line to a new terminus at Holborn Viaduct, opened in 1874. It also built a tunnel (now disused) under Smithfield market to run trains into the Metropolitan Line terminus of Moorgate. As if that was not complicated enough, in 1885 the company built another railway bridge across the river (the one in use today) and opened a station on its north side – the current Blackfriars, but known as St Pauls until 1937. This was only a stone’s throw from Ludgate Hill, but both stations continued to operate until 1929, when Ludgate Hill was closed. The Snow Hill tunnel linking north and south also fell victim to the fall in freight traffic: it had ceased to carry passenger services in 1916, and when goods traffic ended in 1971 it became completely disused and the tracks were removed. It proved only to be a temporary closure, however, as the tunnel was reopened in 1988 to create Thameslink passenger services. Thameslink made Holborn Viaduct station redundant, and it closed in 1990. This proud Victorian terminus, with six platforms, continental boat train services to Dover and a grand hotel, was heavily damaged by bombing in the Second World War and never recovered. Its buildings were replaced in 1963 by an office block with the station entrance on its ground floor, and in its later years the station was a sad place - three bare platforms served by a few weekday peak hour commuter trains. Yet in a way it was only transformed and not removed, as its former site is now the northern entrance to City Thameslink station. Finally from 2008 to 2011 Blackfriars station was entirely rebuilt to cope with increased Thameslink traffic and allow for longer twelve carriage trains. To create space for these, the platforms were extended right across the bridge under a striking new roof of solar panels, and a new entrance to the station was built at the bridge's southern end. So now for the first time since October 1885, when the original Blackfriars Bridge station closed (to passengers: it remained a goods station until 1964), you can access this line from the south side of the river as well as the north. The South Eastern Railway also had a Blackfriars station, which was situated on its line between London Bridge and Waterloo East, about 400 metres to the south of Blackfriars Bridge. This only lasted four years – from 1864 to 1868 – until Waterloo Junction (now Waterloo East: see above) opened to replace it, but is worth mentioning because its name is still clearly visible under the railway bridge across the road from Southwark tube station (see photo on Introduction page: the Charing Cross Railway named in the photo was the company created to raise money for the extension, which was taken over by South Eastern once the line opened).